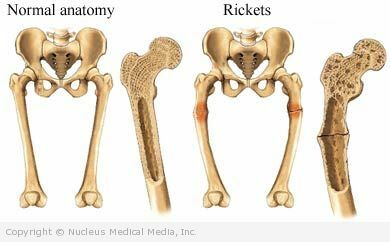 Rickets (in children) and osteomalacia (in adults) are two forms of a metabolic bone disease resulting from vitamin D deficiency. Both cause softening and weakening of bones because of defective or inadequate bone mineralization. The supply of vitamin D from the diet or sun exposure is inadequate. The metabolism of vitamin D is abnormal. Tissue is resistant to the action of vitamin D.
Vitamin D regulates calcium absorption in the body. It also controls levels of calcium and phosphate in bone. Vitamin D is absorbed in the intestines from food. Vitamin D is also produced by the skin during exposure to sunlight. Lack of exposure to sunlight. Consume sufficient vitamin D, calcium, and other minerals. If you think your diet may be deficient, talk with your doctor about alternate sources of vitamins and minerals. Get sufficient, but not excessive, exposure to sunlight. Fifteen minutes a day is usually considered sufficient. Any longer than that requires sun protection with clothing or sunscreens, especially in fair-skinned infants or children. Children with dark skin and their mothers are at increased risk for rickets and may need more sun exposure and dietary supplementation with vitamin D.
Breastfed babies and bottlefed babies who do not get enough vitamin-D fortified formula may need to be given a supplement starting within the first few days of life. Children not getting at least 400 units of vitamin D from their diet may also need supplements. Talk to the doctor to make sure your child is meeting the nutritional requirements for vitamin D.